Parents love to see their kiddo grow up and a switch from diaper to toilet seat is a sign of their growing up. To make this change easy, comfortable and enjoyable to your kiddo’s life choosing the best toddler toilet seat is very important. Although it is a daunting task to make your little one used to the toilet you just need to be patient to train up him/her properly. Once you are successful to train your toddler properly to use toilet seat it will give you a lot of comfort from cleaning up the waste every day. What is Toddler Toilet Seat? The main problem kids face during using normal toilet or adult’s toilet is that the circumference of the hole of normal toilet does not fit with their tiny bottom. So, there is a great possibility of falling them inside the hole. A toddler toilet seat brings a solution to this problem. 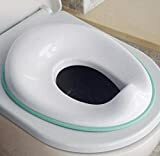 A toddler toilet seat is an extra seat made of plastic to attach over the regular toilet seat that reduces the circumference of the ring of the toilet seat and makes it suitable for your kid to seat. Adding a toddler toilet seat over the normal toilet seat prevents your kids from slipping beside giving them a feeling of confidence. Munchkin has designed a sturdy potty seat for your kiddo to give him a feeling of potting like a rock star. Hahaha……. Listen very funny, isn’t it? Actually, Munchkin says much about their product to make you understand that kids can learn something easily when they find fun and comfort in it and that is what Munchkin wants to provide your kid – fun, and comfort. It is made of plastic and it has an oval shaped hole. Since it is made of plastic there is no possibility of liquid absorption and creating the bad smell of urine. It is available in white color with a thin blue line at the edge. It is light in weight and so your little one can easily put it over the toilet by him/her. The potty seat has a non-skid edge to ensure stability and there is also an ergonomic grip handle so that the baby does not get afraid and feels confident. You also can set up or take off the potty seat easily holding this handle. It comes with a built-in pee guard and feet for easy stand-up storage. There is a deodorizing disc which removes the odor with the power of baking soda. So, your little one will not feel uncomfortable during potting. Munchkin sturdy potty seat is designed to fit with most of the standard toilet seat. You can clean it easily and it also becomes dry quickly. The perfect potty ring manufactured by Fisher Price is a great product to train your kiddo about how to use the toilet. Its contoured shape gives your toddler extra comfort. The perfect potty ring is designed in such a way so that it can fit easily and securely with the regular toilet seat and you do not have to be worried about slipping or sliding once the ring is fitted. Look at the ring and you will notice there is a handle to attach the ring with your toilet ring. You just have to push down the handle and it will be fixed securely with the normal toilet ring. It fits so finely with the toilet seat that there remains no empty space between these two. So there is no chance of leaking pee onto the seat. Actually, it is a common problem with a toilet seat that when kiddo pees it spreads outside. Fisher price perfect Potty Ring consists of a high front guard that has solved this problem. Fisher-Price Perfect Potty Ring comes with a hook. You can hang it from the flash tank with this hook. It also has an integrated flash guard to prevent a mess. You can clean it easily and overall it’s a great accessory to train your kids about using the toilet. Primo Folding Toilet Seat is a great helper of mommy. If your toilet room is small enough to keep your kiddo’s toilet seat, yes you are in the right place – Primo has designed their folding potty seat for you. If it does not seem good to you to hang on the toilet seat on the wall, Primo Folding Toilet Seat is the best choice for your kid. It is small in size and perfect for kids who have just started their toilet training. Moreover, if you have to travel a lot with your kids you should keep a set of primo Folding Potty Seat. You can easily carry it by folding in your travel bag. The truth is we all have to travel sometimes with our little kids, so I think it is better to keep a single set of Primo Folding Toilet Seat in our collection. It consists of folding hinges that protects your kids from skin pinching. It also has handle grips so that your kid does not feel nervous rather feel confident during potting. The manufacturers are very concerned about hygiene. They have ensured that their product is free from BPA, Phthalate, and Lead. Primo has designed their product to be fit only with American standard toilet seat including both elongated and round shape. OXO has made an amazing product that provides you 2 benefits with 1 product. You can use it both as a potty seat and potty chair. And hence they named their product as OXO Tot 2-in-1 Go Potty for Travel. It comes with legs lock for stand-alone use. These legs are strong and sturdy enough to hold the potty seat securely. It is an ideal product to use at the emergency moment as it is designed to open quickly. OXO also provides 3 disposal bags for stand-alone use. Each disposal bag has absorbent pads to absorb liquid; refills are also available. To keep the disposal bag in the right place without any undulation this potty seat has a soft and flexible flap. As I said before that you can also use it as a potty seat. Just fold the legs of this amazing 2 in 1 go potty ring and it is ready to fit on the regular toilet seat. To ensure its stability on the toilet seat the manufacturer has made a non-slip grip. You can also carry it comfortably during traveling because its compact shape fits perfectly in your travel bag, compact storage in your car or stroller. It has a generous shield to prevent any kind of splatter. Its surface is smooth and so very easy to clean. It is designed to fit the small bottom perfectly. Your kid will feel easy and comfortable to use OXO Tot 2-in-1 Go Potty seat. Jool Baby has brought an innovative product of the highest quality in the market for your loving toddler. It is the product of beautiful aesthetic beauty which color easily blends with the color of your bathroom. To ensure security Jool Baby has used non-slip plastic in their product. Moreover, it comes with a non-slip ring at the edge to ensure the highest security. Both baby boy and girl can use this potty seat. For boys, it has specially designed splash guard that prevents pee from spreading outside and helps to keep your bathroom clean. It is designed to fit any standard toilet. So you do not have to worry that whether this potty seat will fit your toilet or not. You can consider Jool Baby Potty Seat as an ideal product to use at the emergency moment because it is easy and quick to install. It also has an adhesive hook for easy stowing when not in use. Since it has a smooth and sleek surface you can clean it easily and quickly using a forceful stream of water. It is very light in weight so your baby can also set it on the toilet seat. You can also carry it without facing any trouble if you need to travel with your baby. Babies and adults have differences in their choices. To adults what seems aesthetically beautiful may not attract babies at all. Babies generally like something cute and colorful; especially they love to see their favorite cartoon character. Paw Patrol has been designed their potty seat keeping in mind the choice of babies. 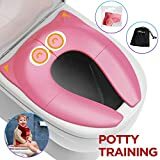 It is a very cute potty seat with eye-catching color and there are so many paw patrols – one of the most favorite cartoons of kids, printed on the top part. Moms who are planning to start toilet training is a great product for their little kiddos. Its soft cushion provides the highest comfort to the tender skin of little babies. The cushion is not fixed rather removable, so you can clean it easily whenever it is needed. Like all other toddler’s toilet seat it also fits properly and securely with standard (both elongated and oval) adult toilet seat. The rubber splash guard comes separately; you have to fix it with the potty seat after receiving the product. You have to buy one more thing and that is a potty hook. The company does not provide it with the product. While buying the potty hook for Paw Patrol Potty Seat please check it whether the hook works for it perfectly or not. Because of buying the wrong hook some customers are facing problems. Gimar has brought an advanced product to make your babies toilet training period easy, comfortable and enjoyable. It’s unique and cute owl like design will easily attract your toddler. This single product is designed to provide multiple benefits. You will be amazed to know that Gimars Potty Seat does not come with 2, 3 or 4 pieces pads, rather total 6 pieces of large silicone pads that have a great anti-slipping property. It is a hygienic product made of non-toxic plastic. To give your toddler highest comfort Gimars has ensured that when you set this potty seat over the regular toilet seat there will remain no friction area. They have enhanced the tightness of joint in their product to prevent any gap that will cause pinching and make your loving kid feeling uncomfortable. It is available in multiple colors. You can buy any one of your and your baby’s choice. It’s a long lasting product. So, once you buy it you do not have to spend extra money on a potty seat for a long time. You can stow it by folding when not being used. It’s also a great potty seat for carrying during traveling. It comes with a waterproof storage bag with zipper. It is easy to clean and a perfect product for babies about 3 years old. Alayna’s potty toilet seat is special and exceptional compared to another toilet seat because of its special features. To turn the adult’s toilet friendly to cute toddlers Alayna’s potty seat is a perfect product. It consists of comfortable and anti-slip pads to protect the tender skin of your toddler from hurting. You can adjust it easily with any standard size toilet seat. Its height is customizable to be adjusted with most of the adult’s toilet. It is available in 2 attachments– one is for shorter toilet and other is for the taller toilet. To ensure cleanliness it comes with a built-in splash guard. The step of the ladder is made of a material that has good anti-slipping property. So you do not have to be worried about falling off your kids by slipping. There is also a pair of the handle so that your kid can climb on the toilet seat easily. It is a foldable toilet seat so you can stow it at any congested place easily. It also assembles easily and quickly. In spite of having several amazing features, it is not so costly. It is also a long lasting product of high quality. So, you can rely on Alayna’s Potty Toilet Seat with Step Stool Ladder. It is really hard to find out the best toddler toilet seat from its huge diversity in material, design, shape, and features. But every hard task becomes easy if you get a proper guideline. 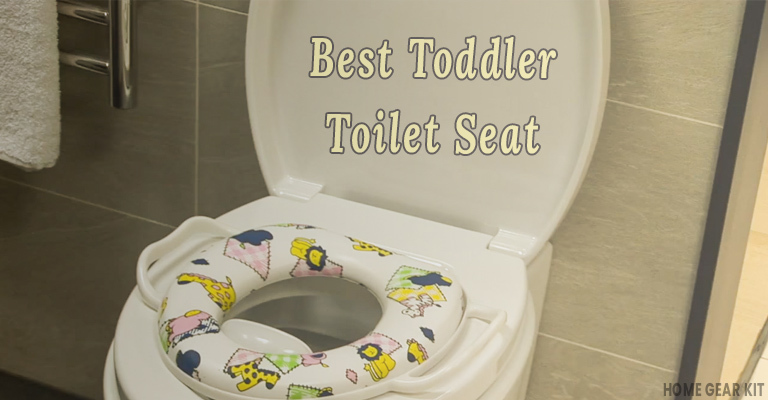 Here is a combination of some effective tips for you to guide you to take the right decision about buying the best toddler toilet seat. Toilet seats have various sizes and each size is designed for the kid of specific age. So during buying a toilet seat for your kid check that for which age range the toilet seat has been designed and make sure that your kid’s age falls with that range. The material is a very important thing you must not ignore while buying a toilet seat for your toddler. The material with which the toilet seat is made has a great effect on the comfort of your kid. It also has a great influence on the health issue of your kid. If you choose toilet seat made of hard material it may cause strain and itchiness on the skin of your kid. So, choose smooth and soft material, sitting on which your kid will feel comfortable. Moreover, the material has a great effect on the hygiene of your toddler’s toilet seat. The material should have good resistance to the absorption of liquid. If it remains wet for a long time your toddler will feel uncomfortable to use a wet toilet seat. It is better to select a potty seat of simple design that can be easily fixed with the regular seat of your toilet. Moreover, it can be easily taken off after completing the need. It is very important to fix the toilet seat of your toddler with the regular toilet seat properly, otherwise, the undulation of toilet seat may cause your kid to slip and an accident may occur. Choosing potty seat made of anti-skid material is helpful to prevent such kind of problems. Kid’s skin is very soft and prone to be attacked by germs. All of us have to travel sometimes with our kids and it is not safe to let the kids use a public toilet without using their special toilet seat. So, to protect your baby’s health select a travel-friendly toilet seat. Some toilet seat for toddlers is designed with special features like the handle, footrest, and backrest, splash guard etc. These features add comforts to get trained up your kids easy to use the toilet. How to Install Toddler Toilet Seat? It is very easy to install a toddler toilet seat. The toddler’s toilet seat is designed in such a way that literally you have to do nothing but putting the toilet seat over the regular toilet seat after removing the lead. If the matter is not clear, I will recommend you to watch the following video. You can also read the supplier’s manual that comes with the product. If your toddler has just been started the potty training, do not leave him/her alone. Keep him in a follow up for a few months. Start teaching him/her the basic lesson of hygiene, the do’s and don’ts and the risk of being unhygienic. Check the stability of the toilet seat with proper care and do not let your toddler lock the door. Clean the toilet seat immediately with a disinfecting liquid after using it and let it dry. Do not allow your toddler to use a wet potty seat. He/she may become sick because of using the wet potty seat. Always do a regular inspection for any stress or infection on the skin of your toddler. Also, inspect the toilet seat on a regular basis if there is any crack or damage because cracked or damaged part may harm your loving toddler. Do not let your toddler play or do anything else with the toilet seat. Q. From when I should start toilet training for my baby? Answer: When your baby reaches at the age of 2.5 to 3 years old you can start toilet training. Q. What can I use to clean up the toilet seat of my toddler? Q. Can I use bathroom cleaner to clean up my toddler’s toilet seat? Answer: No, they are very harsh and abrasive. Potty training is a difficult task but of utmost importance. Sooner or later your kid has to learn it. You have to be patient while training your toddler about how to use the toilet. If you can choose the best toddler toilet seat for your kid this duty of you as a parent will become easier. So while buying a toilet seat check at least twice whether it will meet your requirement and your baby will feel comfortable to use it. Following the safety tips is also very important to protect your loving kid from the disease.